Amidst the turn of the century boomtown development in Oklahoma City, Skirvin Hilton's founder, William Balser “Bill” Skirvin quite literally fulfilled the roles of a mover, shaker, and, township maker. Originally from Michigan, Skirvin acquired land in Oklahoma City during the Land Rush of 1889. He sold that land and then moved to Texas where he continued to acquire wealth in real estate and the oil industry. He founded the town of Alta Loma near Galveston, Texas and then moved back to Oklahoma with his family to further his interests in land and oil. In 1909, as the city was undergoing rapid expansion, an investor from New York City approached Skirvin with an offer to purchase the land from him. The investor stated his intent to build the biggest hotel in Oklahoma. A shrewd businessman, Skirvin turned down his offer, but decided to take it upon himself to build this city defining hotel. Skirvin sought out regionally famous architect, Solomon A. Layton. Together they created a blueprint for a 6 story hotel with a U-shaped design. After the completion of the 5th floor, it is rumored that Layton and Skirvin were celebrating and imbibing when Layton persuaded Skirvin to raise the building to 10 stories in order to keep up with the thriving population of Oklahoma City. A man of big dreams, Skirvin agreed. The 10-story building opened to the public on September 26, 1911. The Skirvin Hotel had two wings, both facing south, 225 rooms and suites, and an interior decorated in English Gothic detail. Skirvin referred to the hotel as his “225 room hobby.” When he was not busy with his land and oil business, Skirvin was in the hotel greeting guests and talking to businessmen and politicians. As a result, the iconic Oklahoma City hotel became a center for politics in the early days of Oklahoma’s statehood. Skirvin and his family moved to a 5 room suite in the hotel in order for Skirvin to keep up with his hobby. 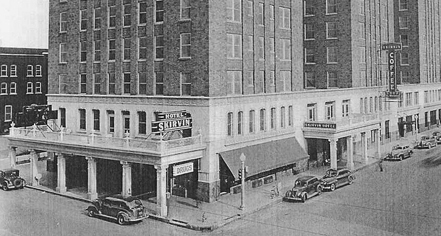 The Skirvin Hotel attracted guests of all calibers from the aforementioned politicians, to ranchers, and even bank robbers; most notably, Al Jennings, an ex-convict who launched his bid for governor right there in the hotel lobby. Skirvin welcomed everyone. 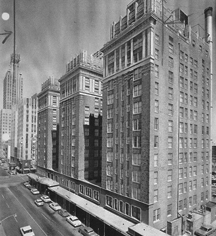 By 1926, the downtown hotel was prospering and with an investment of $650,000, the Skirvin Hotel added a 12-story wing. By 1930, all three stories had been raised and the capacity increased to 525 rooms, a roof garden, a cabaret club which cost $3 million. Development for this project began, but in early 1932, Skirvin fell victim to financial ruin and temporarily abandoned the project. The tower did not see completion until 1938. After Skirvin’s death in 1944, his three children decided to sell the properties. The hotel and tower were sold for $3 million to Dan W. James. For the next 43 years, while its ownership was passed through several investors and businessmen, The Skirvin Hotel remained a choice destination and entertained luminaries and dignitaries, including Harry Truman, Dwight D. Eisenhower, Elvis, Frank Sinatra, Jimmy Hoffa, Roger Staubach, Mikhail Baryshnikov, and Bob Hope. In 1988, Skirvin Hotel closed its doors and remained unoccupied for 19 years. As the 20th century drew to a close and the 21st began, the economic revival of Oklahoma City shook up the sleepy downtown and suppressed businesses began to thrive again. In 2005, contractors began preparing the hotel for a long-awaited renovation project that included exterior restoration, installation of historically accurate windows, and new guest elevators. After more than $50 million in renovations, the hotel reopened as The Skirvin Hilton on February 26, 2007. In 2011, The Skirvin Hilton celebrated its 100th birthday. The Skirvin Hilton Oklahoma City, a member of Historic Hotels of America since 2008, dates back to 1911.